Combine the poppy seeds and 60ml (1/4 cup) of the milk in a small bowl. Set aside for 10 minutes. Combine the flour and sugar in a large bowl. Add the poppy-seed mixture along with remaining milk, essence, extract, butter, egg, orange rind and juice, and stir with a metal spoon until just combined (do not overmix). Spoon the batter among prepared muffin pans. Bake in preheated oven for 25 minutes or until a skewer inserted into the centres comes out clean. Remove from oven and turn onto a wire rack. 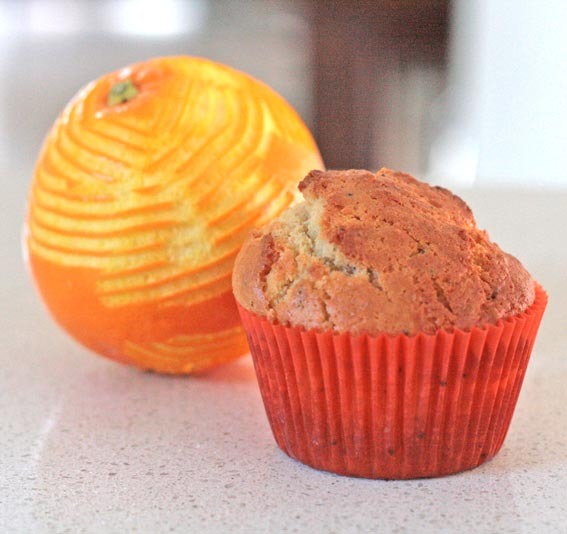 You can freeze these muffins for up to 1 month. Cool to room temperature, place in freezer bags and expel air. Label, date and freeze. Place in the fridge overnight to defrost and bring to room temperature before serving.